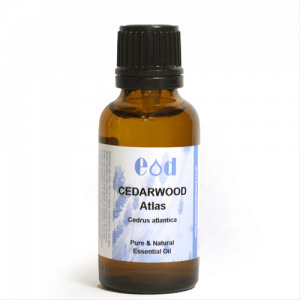 100% Pure and Natural Cedarwood Essential Oil - Suitable for use in aromatherapy when mixed with a carrier oil or base product. Reputed actions: Astringent & Relaxing. Native to the Atlas Mountain regions of Morocco and Algeria, Cedrus Atlantica Bark Oil is the volatile oil obtained from the bark of Cedrus atlantica, Pinaceae. Container: 10ml, 30ml, 100ml supplied in amber glass bottles with black tamper proof dropper cap. 1 Kilo supplied in aluminium tin with white tamper proof cap. Appearance: Clear pale yellow to yellow liquid. 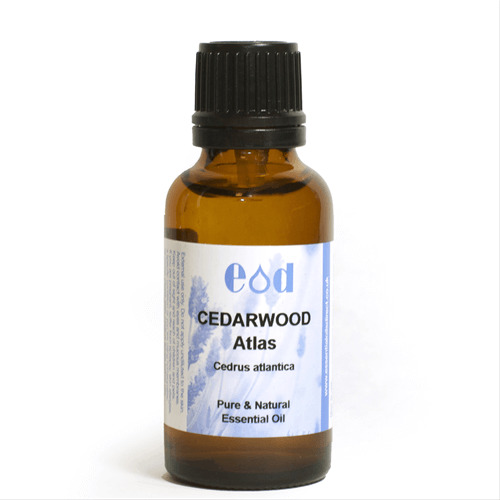 What can Cedarwood Atlas be used for? : Suitable for use in Aromatherapy, Cosmetic and Body Care products. Also suitable for home fragrance products and scented candle manufacture. The manufacturer/end user is always responsible for determining ultimate suitability. Always read the product label. Question: What conditions can this oil be used to treat? Answer: Whilst this essential oil has many reputed uses we are not permitted as a reseller to make any medical claims in respect of this oil. There are numerous books and information sources available online. Question: Can you provide MSDS, Allergens Reports and Certificate of Analysis to enable me to complete my product safety report? Answer: Yes, these are available on request. Please contact us. Please Note: If you require a CofA you need to provide the batch number of the oil you received from us. The batch number is located on the label and is a 4 or 5 digit number. Appearance: Clear liquid pale yellow to brown yellow.